The lack of a commercially available robust and inexpensive laccase is a major barrier to the widespread application of this enzyme in various industrial sectors. By using an efficient system developed in Streptomyces lividans, we have produced by homologous expression 350 mg L−1 of a bacterial laccase with a high purity and without any extensive purification. 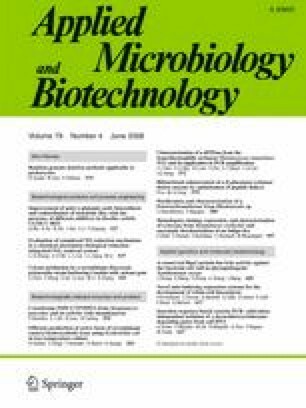 This is the highest production yield reported in the literature for a bacterial laccase. The secreted enzyme achieved oxidation under a wide pH range depending on the substrate: 4.0 for 2,2′-azino-bis(3-ethylbenzothiazoline-6-sulfonate) and 9.0 for 2,6-dimethoxyphenol. Furthermore, this bacterial laccase was found to be quite resistant under various conditions. It withstands pH from 3.0 to 9.0, shows a great thermostability at 70°C and was highly resistant toward conventional inhibitors. For instance, while the laccase of Trametes versicolor was completely inhibited by 1 mM NaN3, the laccase of Streptomyces coelicolor was fully active under the same conditions. To assess application potential of this laccase, we have investigated its ability to decolourise Indigo carmine. This enzyme was able to rapidly decolourise the dye in the presence of syringaldehyde as a redox mediator. This work was supported by the Canada research chair on value-added papers from the Centre Intégré en Pâtes et Papiers (Trois-Rivières, Canada), AgroTerra Biotech (Trois-Rivières, Canada), the Institut National de la Recherche Scientifique—Institut Armand-Frappier (Laval, Canada) and the Natural Sciences and Engineering Research Council of Canada.